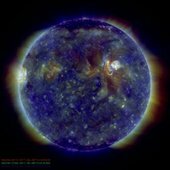 This post describes progress with a study Dynamics of the Solar Atmosphere Generated by the Eigen Modes of Solar Global Oscillations. This post presents a series of hydrodynamic simulations modelling a realistic solar atmosphere using a driver located at 0.5Mm above the temperature minimum. 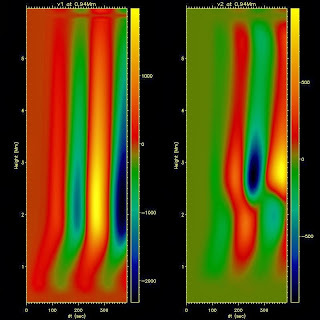 A combination of the VALIIIC and McWhirter solar atmospheres and coronal density profiles were used as the background equilibrium model in the simulations. With the objective of recreating atmospheric motions generated by global resonant oscillation the driver is spatially structured and is extended in a sinusoidal profile arcoss the base of the computational model. 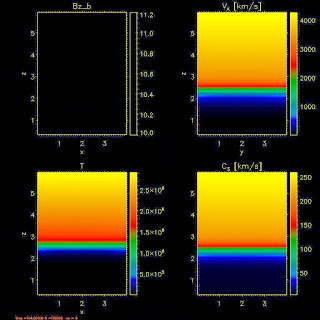 Vertical and horizontal harmonic sources, located at the footpoint region of the open magnetic flux tube, are incorporated in the calculations, to excite oscillations in the domain of interest. To carry out the simulations, we employed the MHD code SMAUG (Sheffield MHD Accelerated Using GPUs). This code is a version of the Sheffield advance code implemented on Graphical processing units [Shelyag2008]. Our results demonstrate the transition of modes with a period of 30s to a mode with a period of 180s,. 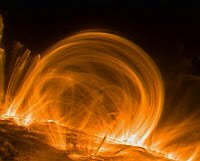 This hydrodynamic effect demonstrating that the Chromosphere is a source of 180s modes. The simulations described were performed using a grid of size 128x128x128. The box size in the vertical direction (the z-direction corresponding to the direction of the solar gravitational field) was 6Mm. The box dimensions in the x and y direction was 4Mm. Continuous boundary conditions were applied to all sides of the box. Above is a movie of the evolution of Vz showing the development of the initial perturbation in the nonmagnetic equilibrium generated by the 30-second-period driver (in ms−1). The z-axis corresponds to height measured in megameters and the x and y horizontal axes are parallel to the solar surface. Above is a distance time plot for the fundamental mode with 30s period for the z and y component of the velocity. The section is taken at 0.94Mm across the box. 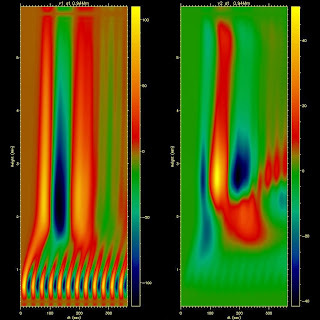 Three-dimensional movie of the evolution of Vz showing the development of the initial perturbation in the nonmagnetic equilibrium generated by the 180-second-period driver (in ms−1). The z-axis corresponds to height measured in megameters and the x and y horizontal axes are parallel to the solar surface. Above is a distance time plot for the fundamental mode with 180s period for the z and y component of the velocity. The section is taken at 0.94Mm across the box. 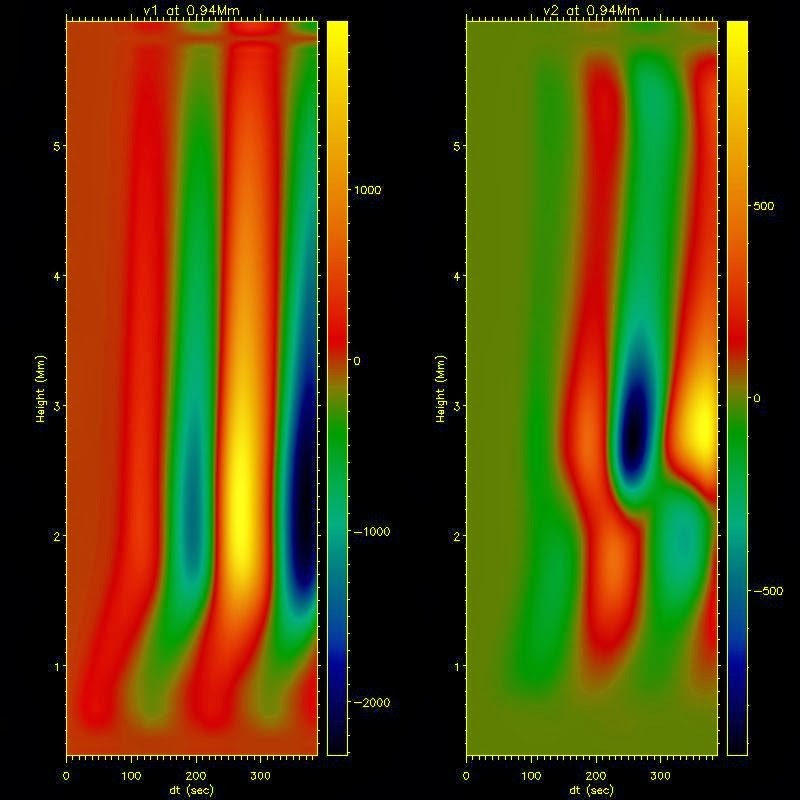 Three-dimensional movie of the evolution of Vz showing the development of the initial perturbation in the nonmagnetic equilibrium generated by the 300-second-period driver (in ms−1). The z-axis corresponds to height measured in megameters and the x and y horizontal axes are parallel to the solar surface. Above is a distance time plot for the fundamental mode with 300s period for the z and y component of the velocity. The section is taken at 0.94Mm across the box. The results presented below are for the same driver with the period of 30s and with a magnetic field of 10G. Three different magnetic configurations are considered. The flux tube field configurations were computed using the, self consistent field method (e.g. see notes from Fred Gents presentation). 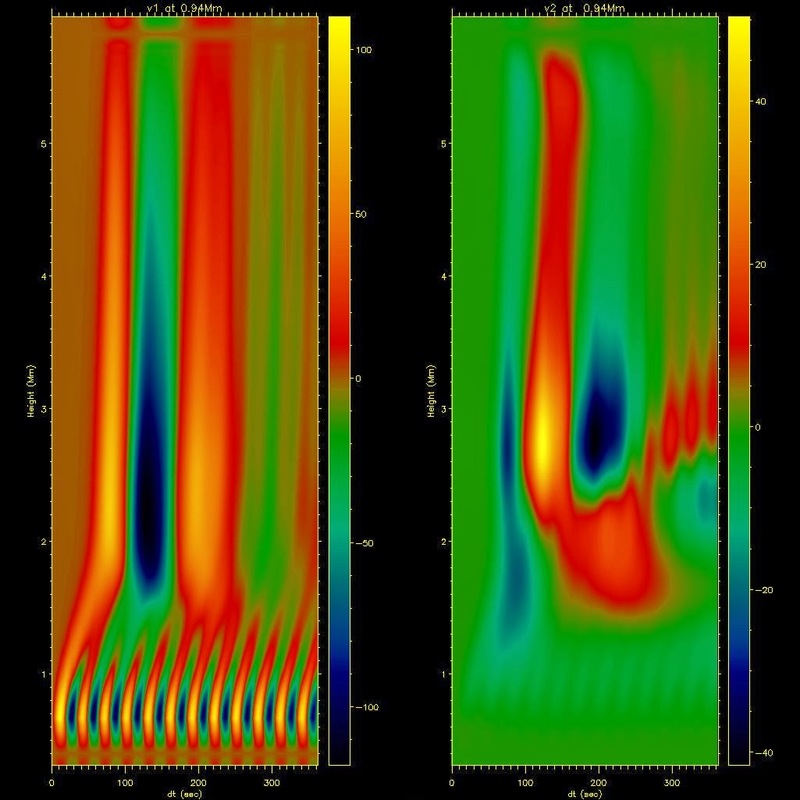 The diagram above shows the magnetic Field Configuration, Alfven Speed, Sound Speed and Temperature Profile for model with constant vertical 10G Magnetic Field. 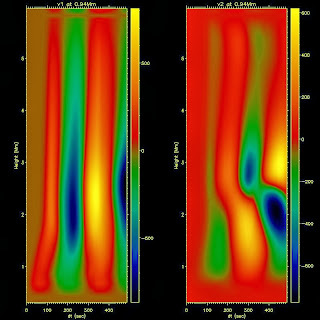 Above is a movie of the evolution of Vz showing the development of the initial perturbation in the nonmagnetic equilibrium generated by the 30-second-period driver (in ms−1) and with the vertical 10G magnetic field. The z-axis corresponds to height measured in megameters and the x and y horizontal axes are parallel to the solar surface. The diagram above shows the magnetic Field Configuration, Alfven Speed, Sound Speed and Temperature Profile for model with 1Mm width Flux Tube. 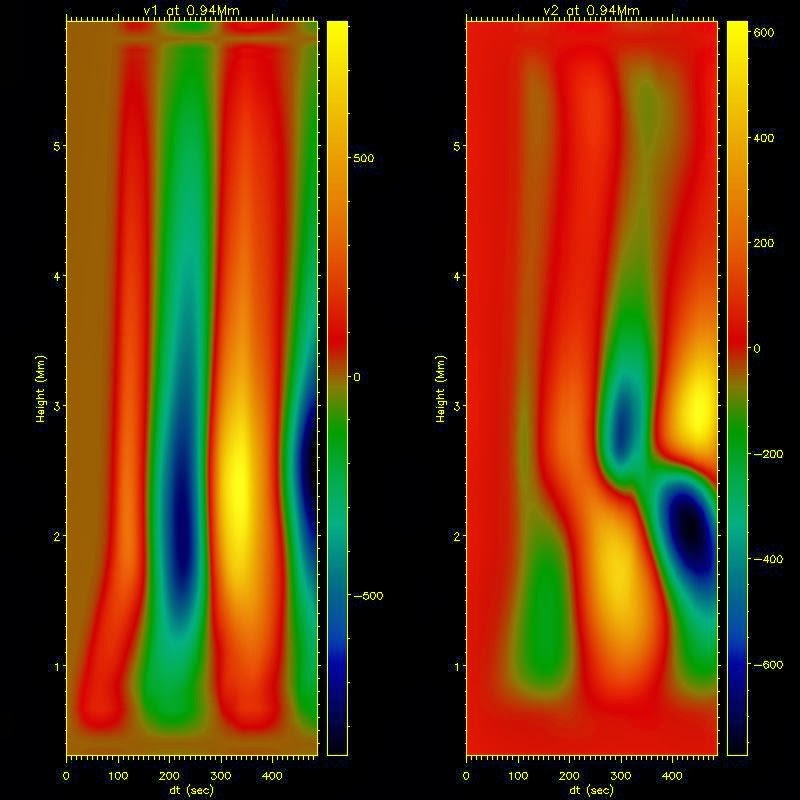 Above is a movie of the evolution of Vz showing the development of the initial perturbation in the nonmagnetic equilibrium generated by the 30-second-period driver (in ms−1) and with the 1Mm magnetic flux tube of maximum strength 10G. The z-axis corresponds to height measured in megameters and the x and y horizontal axes are parallel to the solar surface. The diagram above shows the magnetic Field Configuration, Alfven Speed, Sound Speed and Temperature Profile for model with 2Mm width Flux Tube. 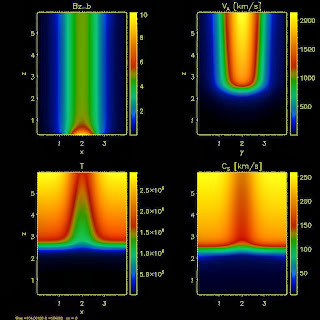 Above is a movie of the evolution of Vz showing the development of the initial perturbation in the nonmagnetic equilibrium generated by the 30-second-period driver (in ms−1) and with the 2Mm magnetic flux tube of maximum strength 10G. The z-axis corresponds to height measured in megameters and the x and y horizontal axes are parallel to the solar surface.